In the uncanny world of my dreams last night, I was wearing my teaching credential around my neck, as a charm on a chain. The credential was a dogtag the length of a small fingernail. It hung next to another charm, a religious symbol, the Unitarian Universalist chalice, which is usually represented as a flat dish with a flame above it. 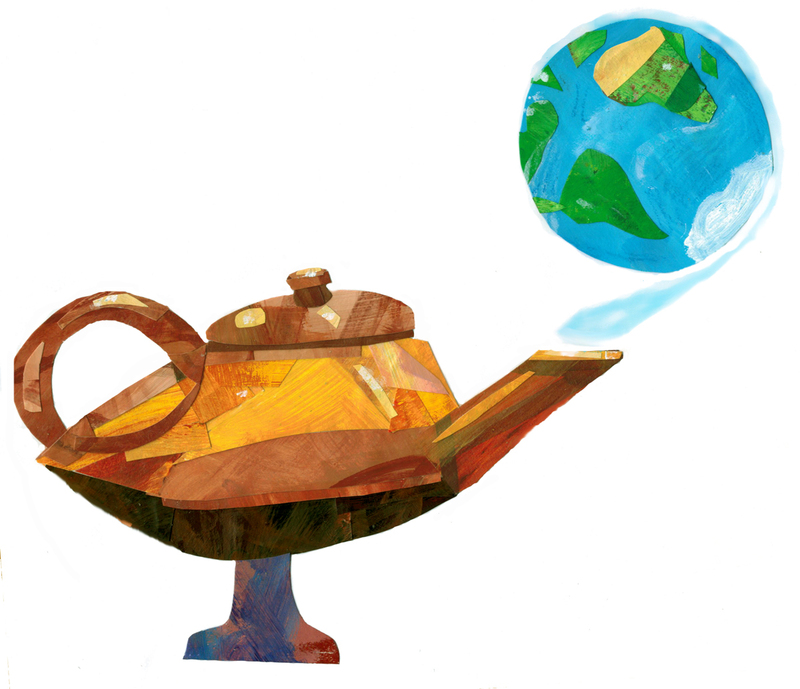 In this dream, though, the chalice had a lid and a spout, like Aladdin’s lamp. I had students in my charge, but they were nowhere to be seen. We had ventured into a moss green field surrounded by birch trees; I had sent them off to the woods to look for hidden treasure. It was clear to me in the dream that this was the most worthwhile lesson I could offer. Instead of tending to my students, I was standing next to a picnic table, chatting with a young man who had come to observe my class, I held the necklace in my hands and tried to explain its meaning. My identity as a (lapsed) Unitarian, with its focus on questions rather than answers, on possibilities rather than dogmas, was something I never mentioned explicitly in my teaching, but it certainly informed the decisions I made. When I looked down, though, the necklace had transformed into a thick white plastic collar. Inset within the plastic shape, spinning on a form-molded axis, was a racquetball-sized plastic globe in blue and green. Within the dream-symbol workshop of my unconscious mind, the product designers were working overtime! In fact, the little globe was identical to a real object, a little treasure of mine that I keep in a drawer in the studio Micropalace where we live (as opposed to the storage space where Hubby and I stockpile most of our possessions). I received it from a dear friend, who was five at the time (now she’s eight). She belongs to my adopted Bay Area family, former housemates of my husband’s, with whom we have been having dinner once a week for the past nine years. Over these years, the parents have allowed Hubby and me to be true auntie and uncle to their three talented, whip-smart, athletic daughters. Their precocious social skills have been enhanced, I like to think, both by an absence of television and by the constant meddling of their many adult friends. One instance of preternatural empathy and grace manifested itself years ago, when I was grieving my father. The Middle Child, not quite six years old at the time, assured me consolingly that death is a natural and universal experience. Everybody dies, she confided, with a pat on the arm and an earnest gaze. Everybody. Even me. To pester, nag, encourage, proofread, and giggle with all three of them–and to receive their dazzling expressions of youthful wisdom–has been one of the great privileges of my life. Unsurprisingly, the Youngest One has exhibited leadership qualities since well before she could speak. While learning to walk, she skillfully managed her adult staff, coordinating their hand-holding shifts. Once she was walking, she was strutting around patting pillows, rounding us up for stuffed animal tea parties. Pulling on sleeves, she dragged us up to dance. She explored her environment avidly, reacting with the same shocked tears of outrage every time she ignored our warnings and toddled herself off the dining room bench. Then she was up and at it again. Not long after her fourth birthday, at her eldest sister’s middle school graduation, I spotted Youngest One off from the festivities, seated under a redwood tree, holding court with three or four preteen boys. For a brief phase, though, she played a little rough with her age mates, insisting on the games she wanted, stealing turns, hoarding toys. Once, in her living room, when she yanked a block out of a smaller kid’s hand, I got indignant. Stop that! What?! Here, she executed a preternatural eye roll but also blushed, clearly upset that I had hollered at her. That’s your guest! I insisted. She held my glance for a few moments, then shrugged philosophically and gave back the block. This was quite a new pattern for her. Usually, when reproached, she went and hid behind the floral chair in the corner. It was the next week when she came up to me and pressed the little blue globe into my hand. A present, she declared in her piccolo voice. Because you’re strong, like me! In my dream as well as in my drawer, then, the globe constitutes a pep-talk, a reminder of Young One’s élan and my own occasional outbreaks of personal efficacy. It’s a pep talk that I can use about now, because I am feeling the temptation to wallow in helplessness. On another front, a dear, lifelong friend of mine is gravely ill, and there’s not a thing I can do about it. That means that in the abstract sense my own world is cracking. As for the teaching tag and the magic chalice, they seem to be a prayer both for the power to effect change and the wisdom to use it well, qualities that feel like they’re far out of my reach. It has taken me most of my life just to learn how to nudge a good-hearted but strong-willed child to put down a block and play nice. Now I want to nudge a whole freaking planet, and keep nudging, in a scenario where the kids with the most toys will never stop grabbing for more. Posted by admin on Tuesday, April 29th, 2014, at 11:27 am, and filed under Uncategorized. Just stopped laughing after noticing you blog’s subtitle.